The Yomiuri Shimbun　NISHINOMIYA, Hyogo — Right-handed ace Sena Sato silenced Waseda Jitsugyo’s big guns in tossing a six-hitter as Sendai Ikuei rolled to a 7-0 victory on Wednesday in the semifinals of the National High School Baseball Championship at Koshien Stadium. Reima Aoki singled in two runs and Taiga Hirasawa belted a three-run homer as the Miyagi school scored all of its runs in the third and fourth innings and never looked back in advancing to the final for the first time in 26 years. In today’s championship game, Sendai Ikuei faces Kanagawa’s Tokai University Sagami, which overpowered East Tokyo’s Kanto Daiichi 10-3 in the second semifinal. Sato, who went into the game with a 1.14 ERA in the tournament, struck out three and walked seven. He held the West Tokyo school’s powerful Nos. 3 and 4 hitters, first-year star Kotaro Kiyomiya and Masaki Kato, to a combined one hit in seven at-bats with a walk. “I’m relieved, and happy,” Sato said in a televised postgame interview of his shutout. Aoki started the scoring in the third inning with a single to right. He later scored to make it 3-0. Waseda Jitsugyo had a chance to strike back in the bottom of the third when Kiyomiya’s infield hit loaded the bases with two outs, but failed to get a run across. In the fourth inning, Sendai Ikuei added a run before Hirasawa hit his third home run of the tournament. 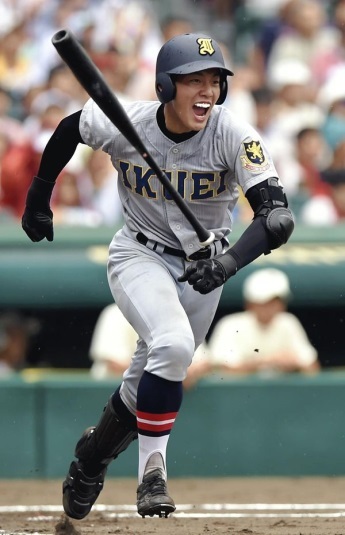 Sendai Ikuei manager Junichiro Sasaki said he had anticipated the game would be more of a slugfest between the hard-hitting teams, adding, “I never expected” such a large margin of victory. Waseda Jitsugyo ace Ko Matsumoto was tagged for six hits and four runs — three earned — in 3⅔ innings. In the second game, Tokai University Sagami, which last appeared in the final in 2010, jumped out to a 4-0 lead in the first inning on back-to-back RBI doubles by Kyohei Miyachi and Naruki Sugizaki and a two-run homer by Hiroshi Toyoda — all before getting their first out. After adding a run in the second on an error, Tokai padded the lead with a four-run fifth, with Miyachi adding a two-run single. Tokai won the title in 1970 while Sendai Ikuei, aiming to become the first champion from the Tohoku region, was runner-up in 1989.